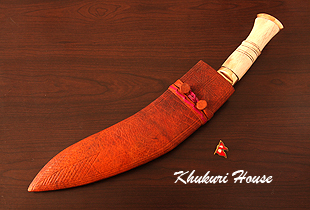 A very new Khukuri from the stable to Khukuri House which is a 13" Full Angkhola Khukuri, beautifully shaped and with a Bone handle with Ganjawal type pattern leather scabbard. Too beautiful to miss out. A very new Khukuri from the stable to Khukuri House which is a 13" Full Angkhola Khukuri, beautifully shaped and with a water buffalo Bone handle with Ganjawal type pattern leather scabbard.